I’m extremely pleased to uncover this website. I want to to thank you for your time for this wonderful read!! I definitely loved every part of it and i also have you book-marked to see new things in your web site. I wanted to share with you that, I bookmarked It�s Simple to Balance the Budget without Higher Taxes | International Liberty at StumbleUpon so my friends will read it as well. Could I also share a tip. Obtaining fantastic video marketing can be highly challenging. I find it most helpful to talk to a a Estate Planning Lawyers San Diego. Our staff of San Diego Estate Planning Lawyer are here to help with all of your legal needs. 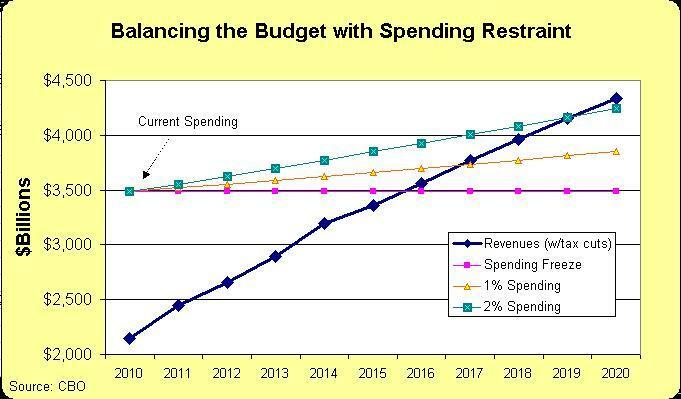 Eliminating baseline budgeting would keep the growth of government low but it would also force the government to become more efficient. If automatic increases in your budget are already baked in the cake, why would you worry about terminating programs that have poor results? By removing the unlimited money, you would force Congress to cut inefficient programs and concentrate resources on productive programs. Your graph suggests federal revenues will increase from slightly over $two-billion to more than $four-billion by the year 2020. That’s double what they are now or about a 100% increase. That in turn averages out to a 10% percent increase per year. That’s foolish. Historically, federal revenues only increase by about two or three percent per year. To average an annual 10% average rise in federal revenues, you would need MUCH higher revenues…i.e. a huge tax increase. So Limbaugh’s proposals of budget freezes followed by slow rates of growth (< 2%) has been correct all these years. Go figure. The programmed rates of growth every year is the "WTF?" moment that most citizens don't know about. Treating spending increases as "base" every year is insane. Thanks for trying to educate our citizens on this ridiculousness.